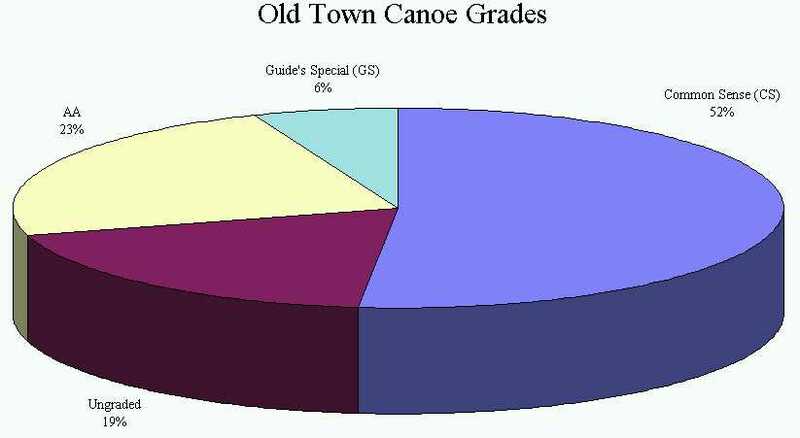 What Are The Old Town Canoe Company Grade Codes? Discussion in 'Frequently Asked Questions (FAQ)' started by Benson Gray, Jul 5, 2018. Old Town used a number of different grades over the years. The first Indian Old Town Canoe Company catalog from 1901 listed an grades A. A. and B. B. along with a utility grade known as a "Guides' Special" (or just G. S. in later years). The 1902 Robertson and Old Town Canoe Company catalog replaced the B. B. with a C. S. grade. The letters stood for "Common Sense" and the chart at http://www.wcha.org/catalogs/old-town/records/grades.jpg shows that more than half of their canoes were built this way over the next half century. The AA grade was discontinued in 1957 and the GS grade only lasted until 1944. The image at http://www.wcha.org/forums/index.php?attachments/36526/ has the description of the top two grades from the 1935 catalog. The obvious differences are that the AA grade typically had all mahogany rails and trim while the CS grade would have lighter colored woods. Canoes built after the grades were discontinued usually had mahogany outside gunwales and spruce inside gunwales so these will often be mistakenly identified as AA grade. See http://www.wcha.org/forums/index.php?threads/12320/, http://www.wcha.org/forums/index.php?threads/12416/, and http://www.wcha.org/forums/index.php?threads/4175/ for some examples of AA grade canoes. See http://www.wcha.org/forums/index.php?threads/12413/ for an example of a CS grade canoe and http://www.wcha.org/forums/index.php?threads/3968/ for a GS grade. The one at http://www.wcha.org/forums/index.php?threads/14682/ was made well after the grades were eliminated. Andy Hutyera and pklonowski like this.